"Because of the dust that absorbed any visible light, this particular tidal disruption event may be just the tip of the iceberg of what until now has been a hidden population," Mattila said. "By looking for these events with infrared and radio telescopes, we may be able to discover many more, and learn from them," sai Miguel Perez-Torres, of the Astrophysical Institute of Andalusia in Granada, Spain. For the first time, astronomers have directly imaged the formation and expansion of a fast-moving jet of material ejected when the powerful gravity of a supermassive black hole ripped apart a star that wandered too close to the cosmic monster. "Never before have we been able to directly observe the formation and evolution of a jet from one of these events," said Perez-Torres. The scientists tracked the event with radio and infrared telescopes, including the National Science Foundation's Very Long Baseline Array (VLBA), in a pair of colliding galaxies called Arp 299, nearly 150 million light-years from Earth. At the core of one of the galaxies, a black hole 20 million times more massive than the Sun shredded a star more than twice the Sun's mass, setting off a chain of events that revealed important details of the violent encounter. 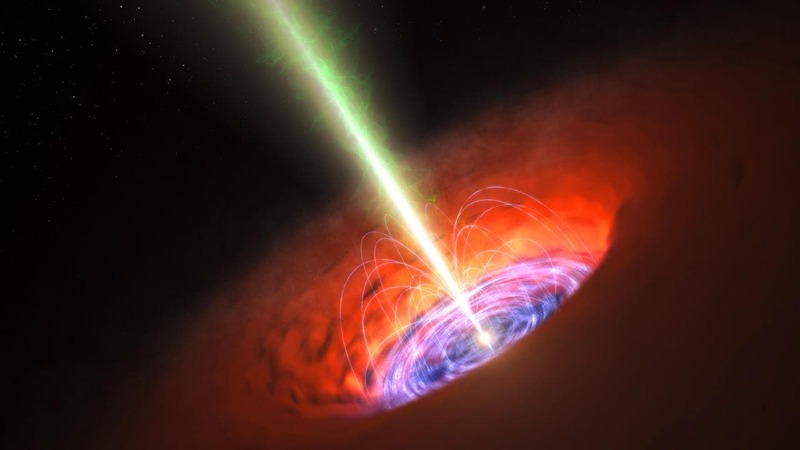 "As time passed, the new object stayed bright at infrared and radio wavelengths, but not in visible light and X-rays," said Seppo Mattila, of the University of Turku in Finland. "The most likely explanation is that thick interstellar gas and dust near the galaxy's center absorbed the X-rays and visible light, then re-radiated it as infrared," he added. The researchers used the Nordic Optical Telescope on the Canary Islands and NASA's Spitzer space telescope to follow the object's infrared emission. "Much of the time, however, supermassive black holes are not actively devouring anything, so they are in a quiet state," Perez-Torres explained. "Tidal disruption events can provide us with a unique opportunity to advance our understanding of the formation and evolution of jets in the vicinities of these powerful objects," he added. The discovery, the scientists said, came as a surprise. The initial infrared burst was discovered as part of a project that sought to detect supernova explosions in such colliding pairs of galaxies. Arp 299 has seen numerous stellar explosions, and has been dubbed a "supernova factory." This new object originally was considered to be a supernova explosion. Only in 2011, six years after discovery, the radio-emitting portion began to show an elongation. Subsequent monitoring showed the expansion growing, confirming that what the scientists are seeing is a jet, not a supernova. Mattila and Perez-Torres led a team of 36 scientists from 26 institutions around the world in the observations of Arp 299. They published their findings in the 14 June online issue of the journal Science.